A grand brick exterior with hip roof and impressive gables creates a striking impact for this luxurious estate home. Elegant tray ceilings enhance several of the home's key rooms: the foyer, dining room, sun room/breakfast area, bedroom/study, and master bedroom and bath. A cathedral ceiling with rear clerestory dormer augments the large, central great room. Note this home's many extras: built-in cabinetry in the great room and bedroom/study, a generous walk-in pantry, fireplaces in the great room and master bedroom, and a three car garage. 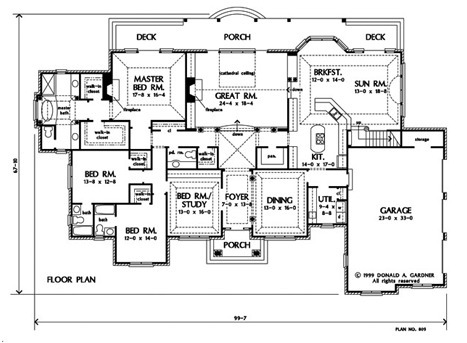 The master suite enjoys rear deck access, his and her walk-in closets, and a spacious bath. Both secondary bedrooms feature private baths and walk-in closets. 1st Floor: 3613 Sq. Ft. 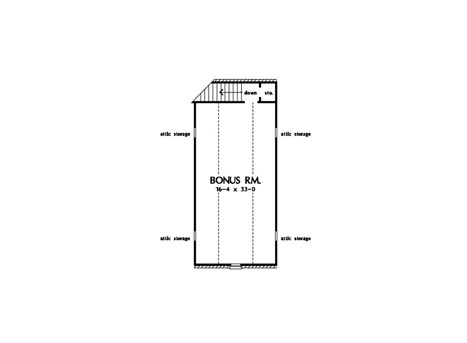 Bonus Room: 590 Sq. 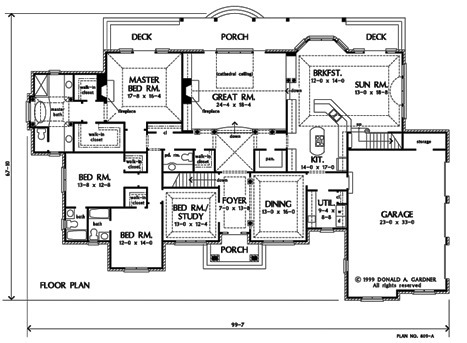 Ft.
House Dimensions: 99' 7" x 67' 10"
Master Bedroom: 17' 8" x 16' 4"
Bedroom / Study (Tray): 13' 0" x 16' 0" x 10' 7"
Garage : 23' 0" x 33' 0" x 0' 0"
Kitchen : 14' 0" x 17' 0" x 9' 0"
Other (Tray): 13' 0" x 18' 8" x 11' 6"
Other #2 (Vaulted): 9' 0" x 9' 0" x 14' 0"
Storage (Bonus) : 3' 0" x 3' 8" x 0' 0"
Bonus Room (Vaulted): 16' 4" x 33' 0" x 9' 8"
Breakfast Room (Tray): 12' 0" x 14' 0" x 11' 6"
Deck / Patio : 16' 4" x 5' 10" x 0' 0"
Deck / Patio #2 : 12' 4" x 5' 10" x 0' 0"
Dining Room (Tray): 13' 0" x 16' 0" x 10' 7"
Foyer (Tray): 7' 0" x 13' 8" x 10' 6"
Garage Storage : 10' 0" x 3' 8" x 0' 0"
Great Room (Cathedral): 24' 4" x 18' 4" x 16' 6"
Master Bedroom (Tray): 17' 8" x 16' 4" x 11' 11"
Porch - Rear : 39' 4" x 0' 7" x 0' 0"
Bedroom #2 : 13' 8" x 12' 8" x 9' 0"
Porch - Front : 11' 4" x 4' 2" x 0' 0"
Utility Room : 9' 4" x 8' 8" x 9' 0"